If you’re getting married soon, you know the stress associated with what is supposed to the best day of your life. But when all is said and done, you will not remember all countless hours of work that went into planning the perfect day; you’ll remember the actual experience and joy of the occasion. With Love Stories TV, a destination for watching wedding videos from around the world in a categorized manner, you’ll get all the ideas and inspiration to make the special day absolutely perfect – even if you aren’t engaged yet! AlleyWatch chatted with founder Rachel Jo Silver about the startup and how it plans to compete with a cutthroat market. Love Stories TV is the place to watch wedding videos! We’re a media company curating the first and largest library of real wedding videos to attract and inspire millennial women. Watching wedding videos is the best way to get ideas and inspiration for your wedding and before Love Stories TV there was no where to do that. On lovestoriestv.com you can use the menu on the home page, or click the tags below each video, to watch wedding films from all over the world according to all the categories you want to sort by when planning a wedding: location, venue type, wedding dress designer, bride’s hairstyle, wedding theme, cinematographer, and more. Or, if you’re not wedding planning quite yet or are happily married but just love love you can watch according to editorial categories like: Groom Reactions, Dads Who Will Make You Cry, and Pets In The Ceremony. Our audience is millennial women! Brides-to-be are using lovestoriestv.com as a tool to get ideas and inspiration for their wedding while women 18-24, who aren’t engaged yet, but love high quality reality TV like the Bachelor are consuming Love Stories TV content as well. Advertising. 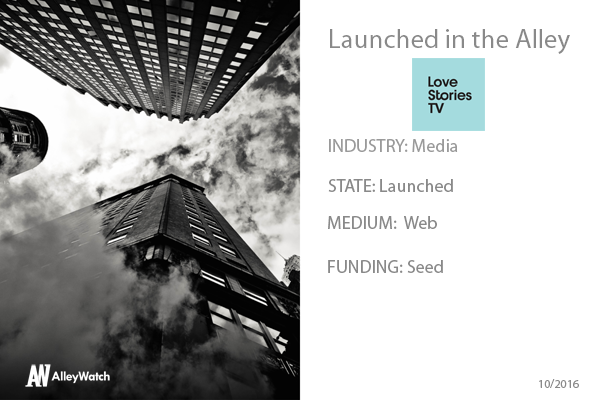 The films are Love Stories TV are ready-made branded content for the brands in them (venues, designers, gifts, hospitality, and more). When I got married in June 2013 and my mother asked me if I wanted to hire a videographer I said no thank you. I was picturing the old style of wedding videos: a man with a big camera on his shoulder, putting a microphone in guests faces asking them to give a message to the couple. At our wedding our family executed an insanely amazing surprise flashmob dance routine and I immediately regretted that there wasn’t a professional there to film it. It was that summer that I started to notice more and more of my friends posting their wedding videos on Facebook. These were not the wedding videos I remembered. The new style of wedding films are closer to feature film trailers than the wedding videos of old. They’re high quality, documentary style, emotive works of art. At this time I had been leading the social media and video team at Birchbox for 4+ years and spent my days thinking about, creating, and starring in content to attract and engage millennial women. Something clicked, “These films are SO amazing, and there is no where to watch them!” I thought. I started to poke around and realized none of the major publishers in the wedding space were focused on video and I identified an opportunity. Love Stories TV was born. Does the thought of a larger organization in the space like XO Group /The Knot moving into your space keep you up at night? No 🙂 We’re the perfect partner for these bigger publishers! We want exposure and they want high quality video content! 1M+ monthly streams and launching our branded content business with high profile partnerships. Keep it simple. Don’t be afraid to pivot but don’t try to start ten businesses in one. Gary Vaynerchuk! I’m a huge believer in his philosophy on the importance of giving then asking, providing value, and understanding what your audience wants. We live here! And, this is where the publishing and advertising industries are. My neighborhood – Brooklyn Heights! So many cozy restaurants, lots of trees to see the leaves changing, and the new park on the water is my favorite place to walk no matter the season.